What Type of Roofing Felt Should Be Used? Ethylene propylene diene monomer and modified bitumen are membranes commonly used to cover flat or low-slope roofing systems. Each is installed on your roof to protect the roof substrate from moisture and UV rays, but they are different materials. EPDM is often a single-ply roofing system, while modified bitumen is installed in at least two layers. EPDM is a synthetic rubber compound manufactured into a single-ply membrane that has a white front and a black backing. EPDM is often given an acrylic coating to make the membrane resistant to UV deterioration and punctures. It is used primarily in single ply roofing and available in a range of thicknesses. Modified bitumen is a material that is composed of asphalt with modifiers added to give it rubber qualities. Two types of modified bitumen are based on the modifiers used in their manufacturing. APP membrane is modified with atactic polypropylene and is more plastic-like than rubber. SBS membrane is modified with styrene butadiene styrene, which makes it more flexible than APP, but also more vulnerable to UV degradation. When installed properly, EPDM has a life of up to 25 years and is typically used for flat roofs that are weathered or inflexible because it is lighter than other materials and easy to install. Modified bitumen membranes might be combined with glass fibers which reinforce the membrane, giving it higher strength and flexibility. The warranty on a modified bitumen roof varies, lasting up to 30 years depending on the number of layers that are applied during installation. For example, a single layer of base material plus a layer of modified bitumen has a 10-year rating, while two base layers is rated for 12 years. 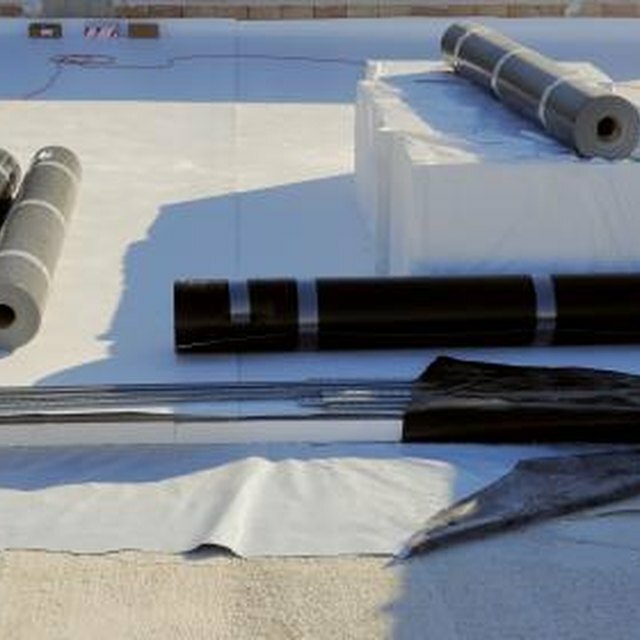 [EPDM roofing](https://homesteadycom/about-5451990-epdm-roofinghtml) can be glued in place, mechanically fastened or ballasted to the roofing substrate. Fully adhered EPDM roofs use adhesives to secure it in place and last from 15 to 20 years when installed in this fashion. When mechanically fastened, EPDM roofs are adhered to the roof with fasteners such as button head nails or plated screws. This method of installation provides a roof that lasts 10 to 15 years. A ballasted EPDM roof is not fasted or glued. It is instead weighted with rocks to hold the membrane in place. This type of roof is rated for less time than fastening or gluing in place, at only 10 years. Modified bitumen roofs are typically installed with a minimum of two layers of roofing felt and hot asphalt that are built up to make a waterproofing layer. It is installed in rolls and is heated using a torch to adhere it to the roofing substrate or it is given a self-adhering coating when manufactured. SBS modified bitumen membranes are usually installed using hot mopping with asphalt, or using an adhesive. APP membranes are commonly heat-welded to the roof surface. Can a Travel Trailer Roof Be Coated with Kool Seal to Stop Leaks? What Is a Roof Grade?